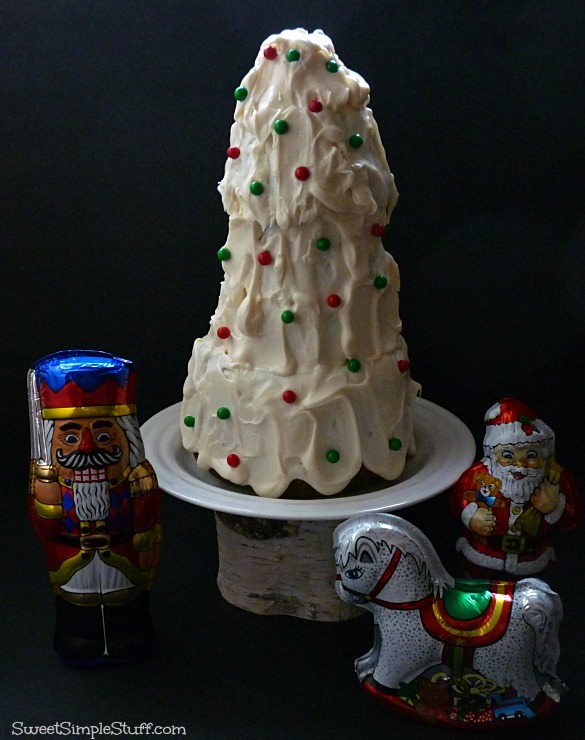 Christmas Tree Cake … not so perfect! 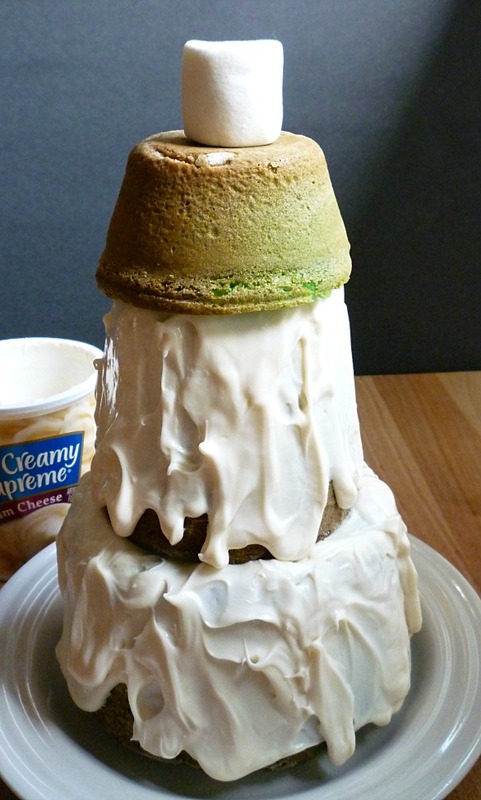 Have you seen the site Cake Wrecks? Well, there is a strong possibility that this cake belongs there. This is what happened … after frosting the cake, there was some frosting leftover … decided to use it up … didn’t realize how unevenly I applied the extra frosting … took photos … still did see what I did … cut the cake and served some … later that night while editing photos … saw my not so handy work! I swear that I am not blind, nor was I consuming alcoholic beverages … guess I was paying more attention to getting the photos taken before the light went away, than what the cake looked like! That’s what happens when I’m in a rush and not wearing my glasses! There was no fixing it … it was cut and consumed! 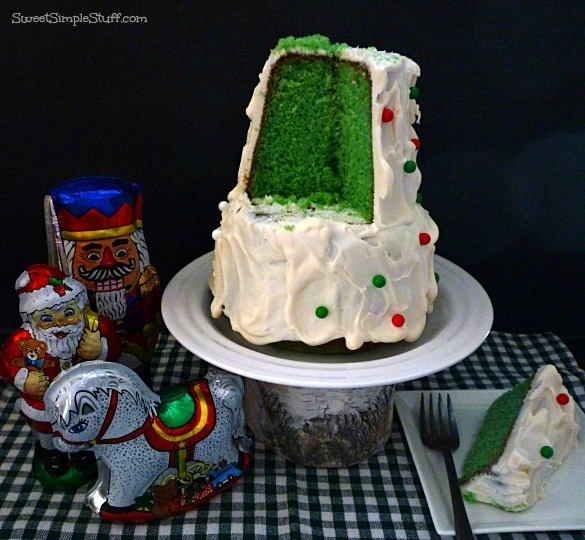 I thought about not sharing this cake at all … then decided what the heck … it’s cake … it’s not perfect and I’m not perfect 😉 Do you remember Charlie Brown’s Christmas tree? So … today is one of those days … I strongly encourage you to do as I say, not as I do! Remove from oven, cool 10 minutes, remove from glass and let cool completely. Level cakes. Place the largest cake (cut side down) on the plate. 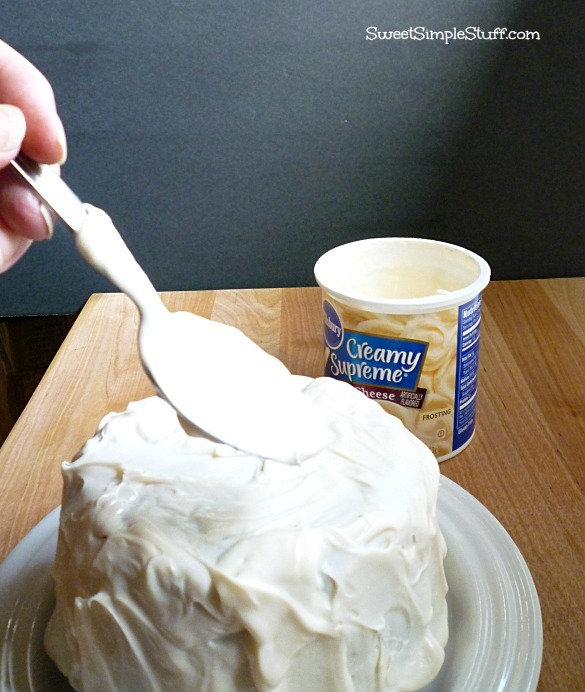 I heated the frosting in the microwave for about 20-25 seconds and spread the icing with the back of a spoon. Continue building the cake. Now that I look back at my photos, I can see where the problems started. I should have used a cupcake (not custard cup)(it would have been a better size) and marshmallow for the top. What can I say … live and learn 😉 You have the benefit of learning from my mistakes! Decorate your tree with small candies … I used pearls (from SweetWorks). I was very excited about finding this piece of birch tree at Michael’s … it was level, clean and I didn’t have to bug my hubby to cut a piece of wood for me! 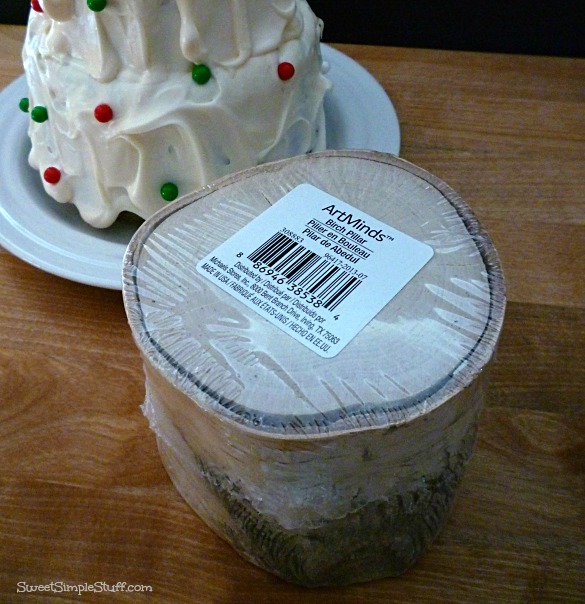 I put some double-sided tape on the wood and placed my finished cake on it. Please note that it’s not secure … the tape just helped the plate not slide around. 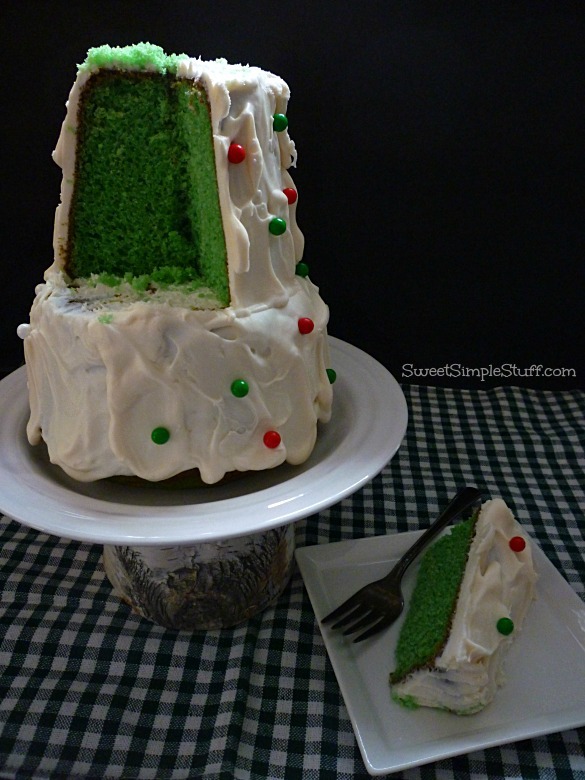 The hubby and Son #3 convinced me to color the cake green … because they believe all Christmas trees should be green. Last night, I finally got around to reading Sunday’s newspaper and found a nice Christmas Tree Cake in the Parade Magazine by Karen Tack and Alan Richardson. 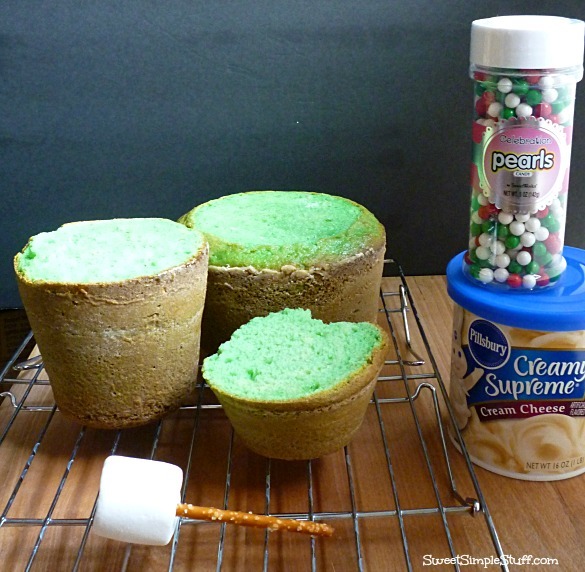 They used an ice cream cone in place of the cupcake and marshmallow … another option! Thank you to SweetWorks for the pearls and cute christmas chocolates! 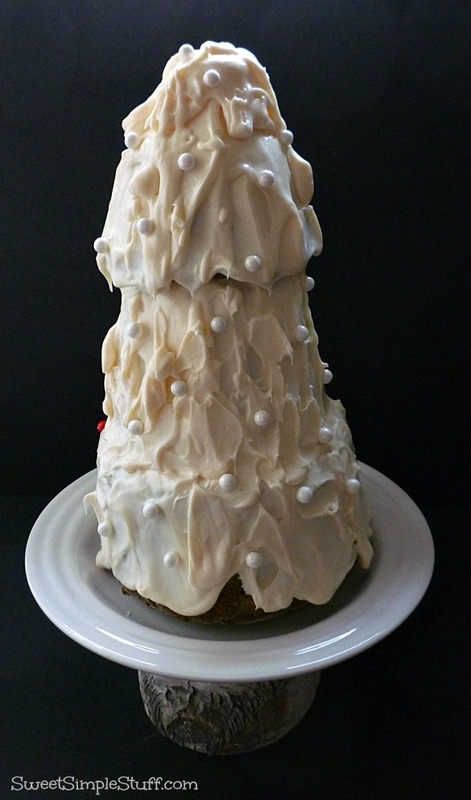 I hope you got a good laugh and learned how (or not how) to build a Christmas tree cake. I ♥ your comments! I am totally cracking up! Oh, I’ve done stuff like that before, and kick myself when I’m editing my pictures. Cake Wrecks here you come! Thank you Beth 🙂 I find it hard to believe that you make mistakes! Who knows … maybe I’ll be a Cake Wreck star, LOL! I love it and the more sloppy icing the better!!! Thank you Christine 🙂 I was going for the “rustic look” … just not “deformed rustic”! That’s what we love about you. You’re willing to share what went wrong with the creations which didn’t go exactly as planned. If something doesn’t go quite right for you – then we feel better, knowing it can happen to the best of us. The bright green batter is so realistic and both the edible white and colored pearls make such pretty decorations. Let me guess – you put white pearls on one side and colored pearls on the other to see which would look best. (??) White pearls for an elegant cake & colored for a more Christmassy look. Don’t look at it as a train wreck but more of a learning curve on how to do 3-D cakes. We learned what to do and what not to do right along with you. So – thanks for sharing one of the not so perfect experiments. It’s why you have such a big following. Thank you Tavette 😉 Yes, I used white pearls on one side … colored on the other, which I really preferred with the Santa and others. I did learn … hope everyone else does too! Thank you Trish 😉 Better to laugh … than to cry! ROFLMBO. 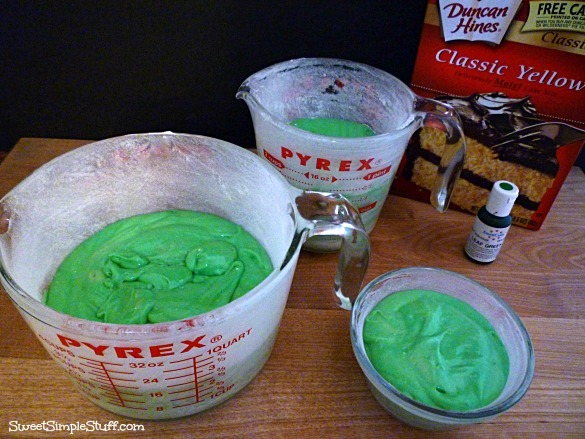 It looked really good.Your Husband & son had a great idea about coloring the Cake Green. The pointed Ice Cream Cones is a great idea as well. Thank you so very much for sharing with us. Thank you Anna 🙂 I’m happy to have given you a good laugh! My feelings on the matter; if it tastes good then who cares what it looks like, and from the looks of it; it must have tasted mighty darn good. You know, if we never made mistakes then we wouldn’t be human now would we? We learn by our mistakes. Oh, love your birch tree block. Noticed the other day that Home Depot also had some but was in a rush so didn’t bring one home with me but still might go back and get me a couple. Thought they would work well for putting my small artificial trees on them that I display out on our enclosed porch. Enjoy your day, have a wonderful weekend and wishing you and your family a Very Merry Christmas. Thank you Colleen 😉 I was the only person disappointed in the appearance of the cake … doesn’t look like what I visioned … everyone else just wanted to eat it! I love the tree stumps … so many fun uses! I’ll check Home Depot … mine was $10!!! … happy I had a coupon! Thank you Karene 😉 It was tasty … that what counts.